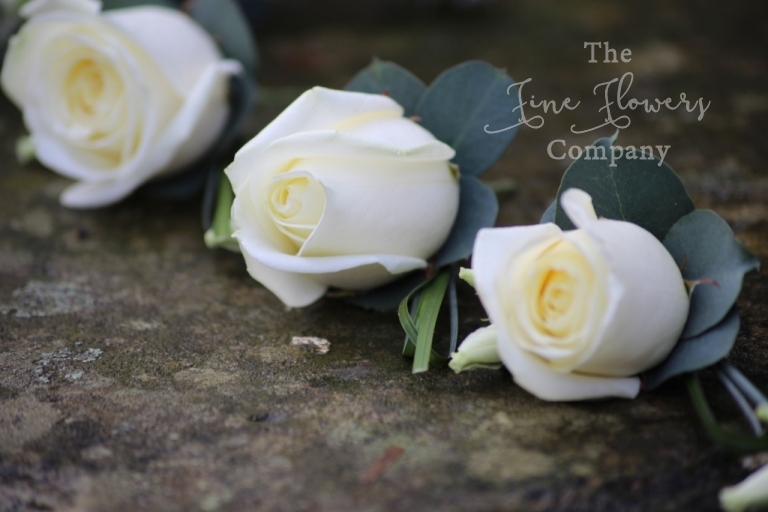 For this 2014 Northbrook Park wedding, these very romantic wedding flowers mark our first return to Northbrook Park this year, just before Valentines day, and what a lovely way to start. 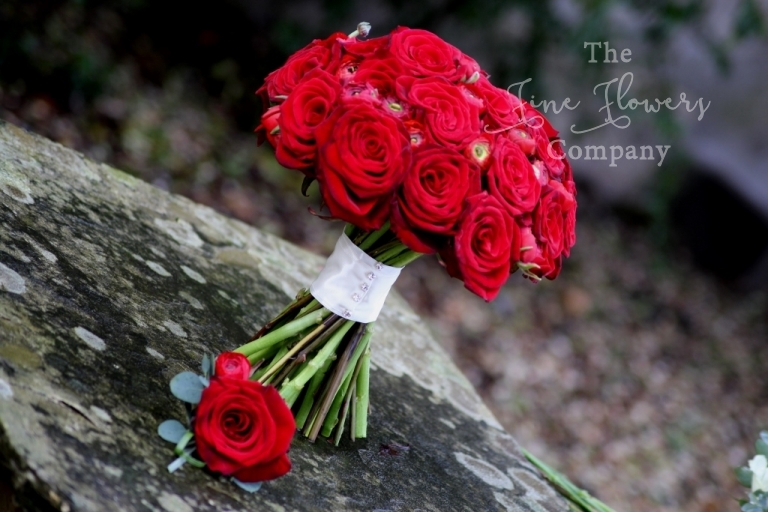 For these Northbrook Park wedding flowers, the theme was deep opulent red and Julie chose deep red Grand Prix roses and stunning red amarylis, as her key wedding flowers. For Julie’s bouquet, we mixed Grand Prix roses with dashes of red ranunculus, to add more texture to the bouquet and her maid of honour carried a bouquet of Avalanche roses and lisianthus to contast with her deep red dress. Coordinating with the bouquets, Stewart wore a Grand Prix red rose buttonhole, and his best man and ushers wore Avalanche rose buttonholes. We have previously created some more beautiful Northbrook Park wedding flowers, as featured in our weddings gallery pages, but this was the first chance to do something a little bit more dramatic in the ceremony room. 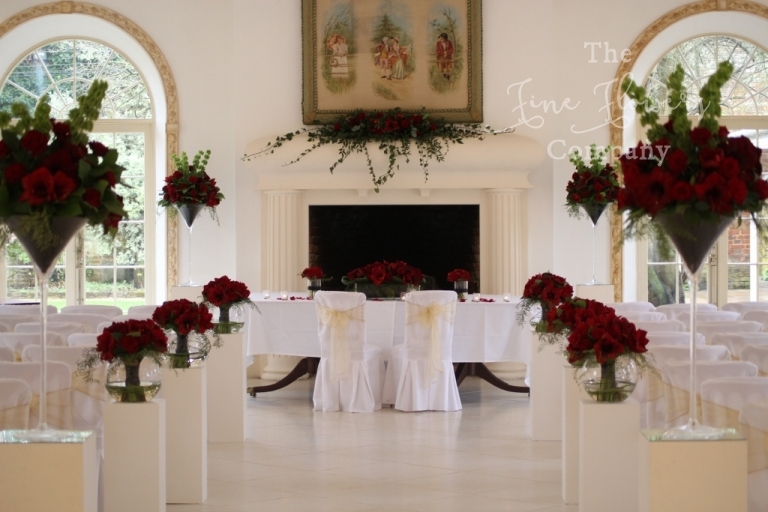 I was very excited at the prospect of creating a beautiful wedding aisle of passion red flowers, for Julie and Stewart’s wedding, and the result didn’t disappoint – even at a very quick glance it created an instant real wow moment as soon you entered the ceremony room. We marked the start and the end of the aisle with tall dramatic Martini vase centrepieces for instant impact as you walk into the room, and we lined the aisle with coordinating low centrepieces. Reusing virtually all the guest table centrepieces first in the ceremony room then in the Vine room, was a really nice way to get the most out of their wedding flowers for Julie and Stewart and I would recommend this approach to everyone who is planning their Northbrook Park wedding flowers or anywhere with a wide enough aisle for that matter. We then dressed the long oval ceremony table with a dramatic long display of roses and amaryllis, and flanked this by two smaller vases and candle holders. Together with the trailing display for the fireplace, this created a really beautiful and romantic effect for the ceremony, and brought much needed colour into the very light room. Moving into the Vine room, the ceremony table displays were used again on the long top table, while the tall and low vases from the aisle, became beautiful guest table centrepieces. I was delighted to be part of Julie and Stewarts wedding day and was thrilled to get a lovely thank you after the wedding and many of the official photos from the wedding. 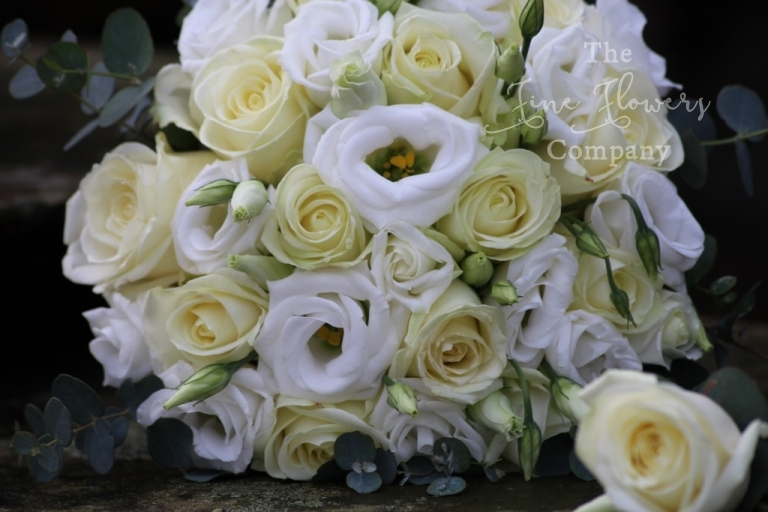 If you are planning your Northbrook Park wedding flowers, and wish to see another Northbrook Park wedding flowers feature please visit our Northbrook Park wedding flowers gallery page. If you like this idea for the wedding aisle, please follow this link to another wedding layout with a beautiful aisle. If you are planning a deep red wedding theme, you may also wish to see our beautiful crystals wedding flowers atBotleys Mansion.